BEIJING - When God closes a door, somewhere he opens a window. For Liu Wei, 23, these words are more than mere encouragement - he proves them every day. 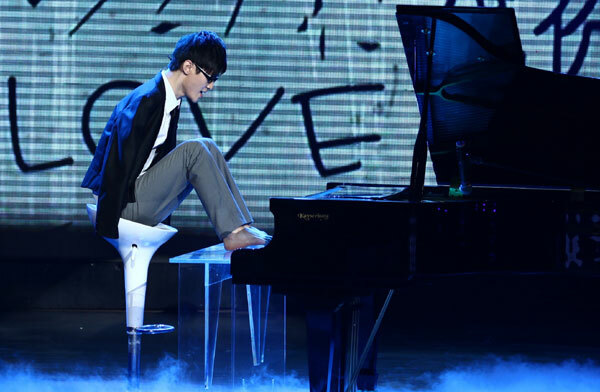 The Beijing native, who lost both his arms at the age of 10, trained himself to be a champion swimmer and is now a pianist who plays with his toes. He is one of the most talked-about finalists on China's Got Talent, a reality show hosted by Shanghai-based Dragon TV similar to the United Kingdom's Britain's Got Talent. Liu was the first to make the reality show's Oct 10 final. If he makes the top three, he will have the chance to join a worldwide tour with former Got Talent winners including Scottish singer Susan Boyle. But Liu is aiming even higher - an album contract with Sony Records. "A soldier will fight long and hard for a bit of colored ribbon," Liu told China Daily, quoting Napoleon. "Since I've come so far in this competition, I have no reason to give up." Liu started to attract nationwide attention in June when he first appeared on the reality show. In his first filmed appearance he played the piece Mariage D'amour, made popular by French pianist Richard Clayderman. When the thunderous applause from the audience finally quieted down, he was asked how he managed to do that. "For me, there are only two options in life," he said on stage. "Die quickly or go for an exciting life." He has chosen the latter. "Those words may cause a controversy in public, but it's not a ploy, just a principle in my life," he said. Liu lost both arms when he accidentally touched an electrified high-voltage wire while playing hide-and-seek. Undeterred, he took to swimming and won several national championships for the disabled. He had aimed for a gold medal during the Beijing Paralympic Games in 2008 when his body failed, stopping him from further training. The accident not only took away his arms, but weakened his immune system. Then the teenager turned to music to brighten his life. Like others in his age, Liu's early interest in music came from songs by Hong Kong pop stars like Andy Lau and Jacky Cheung. It was not until he was 19 that he tried putting his toes on the piano for the first time. He had developed a strong interest in composing and song writing by then when a tutor suggested he try playing the piano if he intended to be a composer. "I put my feet on the keyboard and tried to play a little bit. It sang," he said. "Then I realized this was one more thing I can do just as well as others, and it's not as difficult as it seems." He has since practiced the piano seven hours a day, proving that toes can function as nimbly as fingers. One year later, he even accompanied Andy Lau, the pop star he has long admired. Liu had joined a similar contest to China's Got Talent but failed in the first round because the organizer told him: "You are not suitable for the show". The unpleasant experience didn't frustrate Liu's ambition to explore his musical adventure. "It's really hard to meet a master who can give you a tip, especially when you are a nobody," Liu said, explaining the reason that motivated him to be part of the show. "I'm here for professional advice from the judges who I can learn from, rather than just hunting for a springboard," Liu continued. "It is great that the program doesn't decree that you must use your hands to play the piano." In fact, the armless young man has been financially independent for some time. He runs bars with friends in Beijing and the businesses could definitely provide him with a decent living. Thanks to the popularity of the reality show, Liu has become an overnight celebrity. He was once invited to share his experience with more than 220 million primary and middle school students across China in an inspiring TV show along with Yuan Longping, China's father of hybrid rice, and Internet business tycoon Ma Yun, who founded the country's first e-commerce website - china.alibaba.com - in 1998. "Public attention means encouragement and trust to me, but that won't change my life," Liu said. "All I care about is how to improve my musical skills and become a successful composer and songwriter. "For me, life is impossible without air, water or music."